Are you someone with strong leadership skills and experience of overseeing multiple projects, able to coordinate the many projects and enterprises that make up the Hornbeam? You’ll need to have an ability to delegate, and get the best out of people, and a strong commitment to driving social change. Hornbeam is also looking for people with experience in strategy, food enterprises, partnerships or finance who also have some time on their hands. Are you familiar with online photography storage? Could you help Hornbeam create a system to store all our amazing photos in one place and for staff to have easy access to them? It’s nearly Walthamstow Garden Party time (15 & 16 July in Lloyd Park)! The Hornbeam and the Learning Lodge will have a stall to tell people about our work and if you are a fan of the Hornbeam and love chatting to people, they would love you join them. Are you excited by spanners and spreadsheets as well as produce and people? We are looking for a person or people with a range of skills in transport (including driving on our weekly delivery round), communications and finance to join our workers’ co-operative and support our work. The tasks and responsibilities that currently need filling – and the skills and qualities we are seeking – are set out here. Deadline for applications is midday on Monday 13 March. Interviews will take place on: Wednesday 15 March. Running in partnership with Waltham Forest Adult Learning Service. Based at the Adult Learning site in Leytonstone, you will gain skills in plant care, general plant identification techniques, ornamental designs and maintenance especially linked to the spring-summer garden with basic amenity care such as lawns. All theoretical work is backed up by practice in a small outdoor learning garden at the venue and at a local Park. Suitable for those wishing to improve their general gardening knowledge and confidence. It is a very good foundation for the Garden Maintenance Level 2 Award that follows on from it. The tutor can support you to apply for this progression opportunity. This two day gardening course is developed to offer quick direction for those just starting out on an allotment, and is also suitable for anyone wanting a quick introduction to organic food growing for their own back gardens. 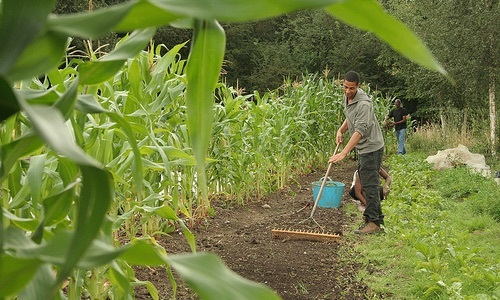 It is a partnership with Waltham Forest Adult Learning Service running at OrganicLea’s food growing site. We are likely to continue to offer Level 2 City and Guilds opportunities starting in Autumn and Winter 2017 at Organiclea’s Hawkwood site. A description of of these courses for 2016 is on our website. Please email clare@organiclea.org.uk if you would like to be informed of application process as soon as course funding for 2017-18 is confirmed by May 2016. “From Small Acorns….” Tree workshops at Lordship Rec, Higham Road, Tottenham N17 (meet in the Hub Café). Practical tree care; planting, protecting, mulching young and newly planted native species trees in Lordship Rec to enhance bio-diversity, and much more! With Russell Miller, Arboriculturist, environmental expert and lead member of Hackney Tree Musketeers. Types and varieties of trees, soils, practical work in Lordship Rec, Orchard planting, pruning, mulching, protecting newly planted trees – and much more! With Marina O’Connell, organic fruit farmer and permaculture teacher, from The Apricot Centre, Manningtree in Essex. No experience needed. Certificates will be awarded to attendees. Children are welcome with accompanying parents. FREE hot drinks! Bring lunch to share, or buy from The Hub cafe. Much of the workshop will take place outdoors. Come in suitable warm weatherproof clothing and footwear (it can be muddy and wet). Cost: between £1 and £10 for each day workshop, pay what you can afford. Book a place via Brown Paper Tickets or call in to the Hub office in Lordship Recreation Ground from Monday to Thursday 9am-3pm. Design for active community transformation in our neighbourhoods with Permaculture! This one day workshop can either be considered as a stand alone introduction to Permaculture ethics, principles and design, or else can be a lead-in to the more in depth full 72 hour Permaculture Design Course. The day is led by experienced permaculture teacher Graham Burnett (author and illustrator of Permaculture- a Beginners Guide) in partnership with May Project Gardens, a team of grassroots activists working to educate and empower urban communities to live sustainably. A permaculture course offering positive design for your life, your community and your world by empowering the genius inside all of us! D4A is about regenerative learning, enabling individuals, organisations and communities to come together over six weekends to create empowering solutions to the real world challenges we are all facing in these times of change. A participatory and dynamic course led by Graham Burnett, Claire White, James Taylor and guest teachers. 12 weekend days based in or near to Brighton. This wide ranging course looks at how we can design resilient, abundant human ‘ecosystems’; working collaboratively with one another to care for the planet, each other and ourselves. Course includes visits to working projects including Ben Law’s woodland house and business. 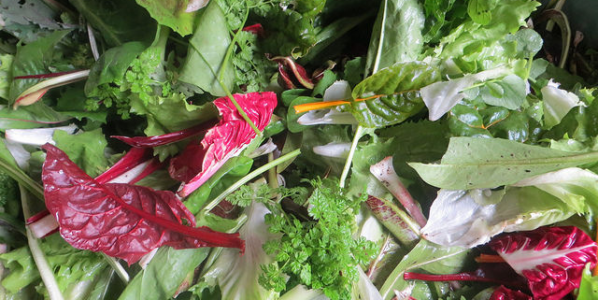 We are looking for two people to assist with, and learn about commercial salad growing; to progress to managing their own salad rotations at Hawkwood, before graduating to their own site. 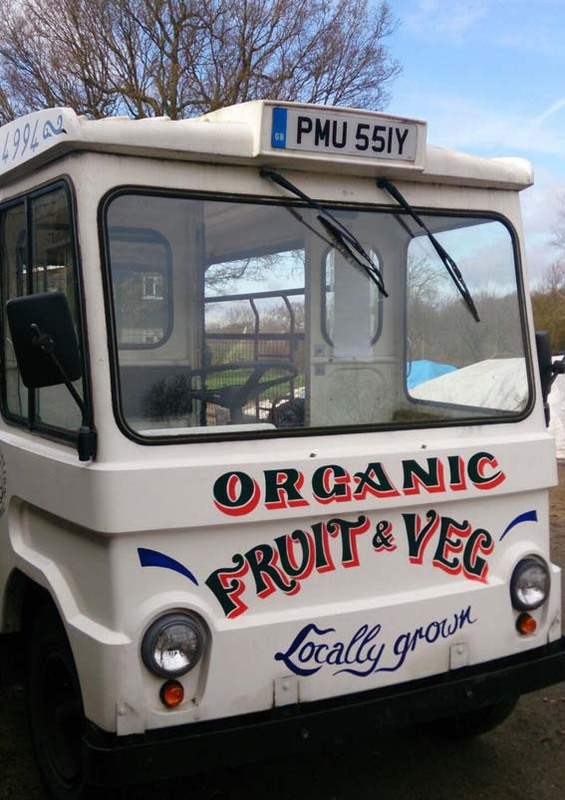 OrganicLea is committed to supporting them in finding an appropriate site, and providing them with growing, marketing and next-steps support throughout the process. Hands-on production training at the harvest end of our market gardening work: A small team help the production team harvest produce across Hawkwood ready for our box scheme and restaurant customers. Opportunity involves getting closer to our work as you help with harvesting, weighing, quality control and packing of produce. Harvest hands can expect to take home a small bag of produce every week and be involved in focused gardening activity after the harvesting is completed. We ask for a regular commitment of 8 sessions (min) to help give you good training in tasks and predict capacity. Contact volunteering@organiclea.org.uk or call 020 8524 4994. Other short and longer term placements at Hawkwood will be confirmed in coming month including traineeships (9 month placements) and on-site buddy scheme. Learn more about our work and grow skills with others growing food, by joining the regular volunteer team at Hawkwood with opportunities on Tuesday afternoons, Wednesdays and Fridays. Contact volunteering@organiclea.org.uk to register for the next induction session or find out what could work for you. Last Sunday of the month, 10am-1pm: ‘Seasonal task blitz’ Acting on feedback from those who can’t make weekly volunteering sessions we now include a hands-on training task as part of the Open Day from 10-1pm on the last Sunday of each month. This includes the chance to chat to our growers throughout the morning. The next one will be Sunday 29 January, 10-1. City and Guilds Level 1 qualifications (with a range of learning options) are running from Hawkwood and scheduled to start in either February or March 2017. They take place on selected Wednesdays and Fridays. We run these in partnership with Waltham Forest Adult Learning Service (WFALS). Contact clare@organiclea.org.uk for further details and to discuss course requirements. Develop your own skills within an early years Forest School setting. Volunteer opportunities on Thursdays and Fridays for fixed number of sessions, email volunteering@organiclea.org.uk for more details. Are you passionate about reducing food waste? Spread the word to the public and local food retailers that it is not illegal to sell food that is passed its best before date. You can help support shops to sell food passed its Best Before date at a reduced cost which will reduce harm to our environment and help people save money. Would you like to help stop edible food being thrown away? Shops can legally sell food past it’s Best Before date, but if they are worried about trying this shops can donate the food instead and you can help us make sure the food gets to a good home. Redistribution will make sure that the food and all the resources it took to make it do not go to waste. Plus, it will prove that it is perfectly good and edible. Click here for details on this role. Would you like to help people get low-cost food and reduce climate change at the same time? You can join the Waltham Forest Food Rescuers team to help run ‘pay-what-you-feel’ stalls where people can get food for free or a donation of their choice. The stalls are a great place to talk to members of the public about how we can all help reduce the amount of edible food being wasted and inform people that by simply eating food that is past the best before date (but still safe to eat) they are acting to reduce food waste. Reducing food waste can help your local community and the wider environment. Enjoying cooking and sharing food with people? You can help cook a ‘pay-what-you-feel’ meal from food that was going to be wasted. The People’s Kitchen aims to bring people who live and work locally together to share a cheap lunch in a friendly environment. It is currently on the first Monday of the month but there is potential for many more in Waltham Forest if there are enthusiastic volunteers. Apple Day is one of Walthamstow’s regular highlights of the year so join us again for another apple-y adventure held in the gorgeous gardens of Vestry House Museum and organised by the The Hornbeam Centre and Cafe with partners OrganicLea, Artillery and involving lots of amazing local community organisations. Come and taste and buy apples, apple juice, cider and cake! Do apple bobbing, use the vintage apple press to make juice, try your luck in the longest peel competition and enter the International Apple Recipe competition! All details on our website. Apple Day takes place 11am – 3pm on Saturday 8th October. 5 City and Guilds courses are starting this Autumn: There are still places on all courses, but those starting in September are booking-up fast. Organiclea has always worked in close partnership with Waltham Forest Adult Learning Service to deliver a growing range of gardening courses. Based at the Hawkwood Plant Nursery, you will gain skills linked to planning and design for the food garden; soil management techniques and analysis, creating and using organic matter e.g compost, planting plans for all season production, winter tasks and pest management. All theoretical work is backed up by practice at this market garden site. It is designed to build basic and technical skills for anyone who is keen to develop their knowledge for the home environment or learn more about working in this area. Venue: Hawkwood Plant Nursery – Organiclea’s growing site. To book on this course phone: 020 8496 2974 and quote above course code. Based at the Adult Learning site in Leytonstone, you will gain skills in plant care, general plant identification techniques, ornamental designs and maintenance especially linked to the winter garden with basic amenity care such as lawns. All theoretical work is backed up by practice in a small outdoor learning garden at the venue and at a local Park. Suitable for those wishing to improve their general gardening knowledge and confidence. It is a very good foundation for the Garden Maintenance Level 2 Award that follows on from it. The tutor can support you to apply for this progression opportunity. This 28 week intensive and highly recommended course is for those who are already gardening and who want a more theoretical base to develop their gardening practice. It has been running in partnership with Organiclea since 2007 and interests those keen to commit more time to gardening work at a personnel and (potential) employment level. Learning includes units on understanding soil science, plant science, techniques in organic horticulture and fruit and vegetable production by organic methods. This course demands commitment to both learning and self-study; and delivers a lot in terms of academic learning and confidence in the detail of gardening practice. The theory learnt in the classroom and in home-study/research/essay writing, is backed up by practical assessments in the Hawkwood vegetable and fruit gardens. To enroll on this course: Applicants for this intensive course either need a Level 1 in gardening or demonstrable experience and commitment to an equivalent level. Contact Hannah Claxton, hannahclaxton@googlemail.com (tutor) – to receive a pre-course assessment questionnaire. Then Tuesday 6 September is the preferred date for meeting the tutor to complete the pre-course assessment process. Discuss your availability for this date when contacting Hannah. This 9 week Award course focuses on plant-care topics mainly in ornamental designed situations and basic amenity care (such as lawns). It is a Practical Horticultural Skills qualification with guided classroom learning supported by practical activities in a garden raised-bed situation and local park environment. Topics to be studied include: Plant propagation; identifying and dealing with diseases and disorders; planting out of shrubs, trees and other plants, ornamental plant identification. To enrol on this course: Applicants either need a Level 1 in gardening or demonstrable experience and commitment to an equivalent level. Contact the Programme Coordinator, Joanne.Jerrold@walthamforest.gov.uk for a pre-assessment questionairre and if necessary any follow up with Maria Casarrubios the tutor. The College can then complete the enrollment process. This course offers accredited learning for those wanting to learn within fixed term work or volunteer employment. The commitment is to BOTH guided learning dates at the Hawkwood Plant Nursery, 2 Thursdays a month; ALONGSIDE, 8 hours a week in work placement (paid or voluntary) at horticultural site/s. Taught sessions will equip the working horticulturalist with essential know-how to Level 2 standard including range of topics that prepare for planting; techniques for plant care; training and pruning in fruit production; stem cutting propagation; pedestrian controlled rotary cultivation; and identifying plants by botanical names. Your work placement will allow you to be assessed at working site and offer the opportunity to embed this learning in routine gardening practice backed up by reflective work-book, reading and work-based learning support process. Start date: Thursday 12 December (10.30-4.30). (The timetable then involves 2-3 guided learning or assessment Thursdays every month, some half day and some full days. The tutor can share clear timetable during pre-assessment – see below). Work placement is an additional weekly commitment of 8 hours (minimum). Completion date: Thursday 20 July. To enrol on this course: Applicants either need a Level 1 in gardening or demonstrable experience and commitment to an equivalent level; you will need to undertake a short assessment with the tutor; and to have secured an appropriate work placement for the Diploma (Note the tutor can support you to find a placement). Contact the tutor, ru@organiclea.org.uk to arrange this. Enrollment takes place after this assessment meeting. One day Organic Gardening Workshops are taking place in the Autumn with Adult Learning Service at Lloyd Park in Walthamstow; ‘Organic Lawn Maintenance’ (18 September code: LYG8096), ‘Organic Pest and Disease Management’ (25 September code: LYG8095), ‘Making and Using Compost in the Garden’ (2 October code: LYG8098). Early Bird Discount: You get 10% off any course booked with Adult Learning Service if you enroll by end of the day on Friday 16 September – so investigate those that interest you, and please share around if you have done a course with Organiclea / Adult Learning and want to recommend it to others. Seasonal sharing and learning also happening at this harvest’s locally organised ‘Cultivate Festival’ – starting on the 3 September for a week. The Organiclea team are involved in a lot of free workshops that build on our work with young people OR selling produce to restaurants OR getting to know soil OR growing over 50 varieties of chilli AND just enjoying what we do! See http://www.cultivatewf.org/ for full programme and for all organising details. p.s Tutors for all the above accredited courses and workshops will be celebrating this year’s learner achievements at the Opening Produce Show / Graduation ceremony – come find us there and talk about the courses, around 2pm at St Johns Baptist Church, High Road in Leytonstone, E11 in the ‘Cultivate Marquee’. 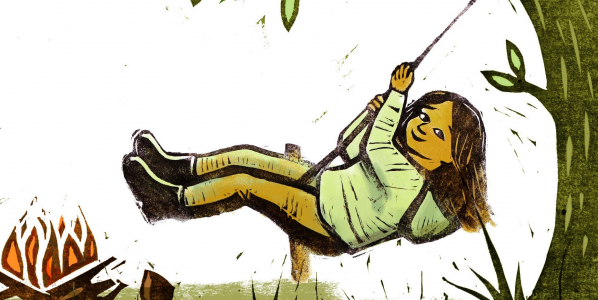 What if human well-being didn’t have to be at the expense of the environment? What if we could simultaneously increase genuine prosperity, reduce social inequality, and tackle climate change? In this day-long seminar, we will share an alternative paradigm: ‘the economics of happiness’. Presentations and discussion will highlight human-scale economies and the steps—at the community, national, and international levels—that can bring us there. Speakers include Helena Norberg-Hodge, Lawrence Bloom, Diego Isabel La Moneda, and Mike Smith. This workshop will provide an opportunity to take part in the rising global-to-local movement and to discuss the strategies required to move away from a corporate-led growth economy towards diverse local economies in service of people and planet. Learn about inspiring initiatives worldwide aimed at resisting global trade treaties and reclaiming our communities, cultures and natural environment. Meet others who care about democracy, social justice, fulfilling and dignified livelihoods, nutritious fresh food, and about passing on a healthy and diverse environment to our children. Speakers include Helena Norberg-Hodge, Molly Scott Cato, James Skinner, Rupert Read, Bruno Lacey and Charlotte O’Connor. Local Futures is a charitable organisation whose mission it is to protect and renew ecological and social well-being by promoting a systemic shift away from economic globalisation towards localisation. Through its ‘education for action’ programmes, Local Futures develops innovative models and tools to catalyse collaboration for strategic change at the community and international levels. Project worker: Low-Cost-Living. Paid. Start 3rd October. Apple Day Team: Volunteers, Mondays in September. Coordinating Team: Monthly meetings and some time in between. For more information on each of these roles see below. 3 days a week, core day Monday. Supporting joint fundraising for more community food projects with our partners. One core day will be a Monday as this is the day that the Cafe is closed and ‘Community Mondays’ happen. much of the project work will happen as part of Community Mondays. You will be working with others: the overall coordinating team, project worker at the Learning Lodge E4, cafe workers and volunteers, and the finance worker. Being part of the Hornbeam means contributing to inspiring, real social change. It can be chaotic and it is often under- resourced. If this is something you think you can thrive on – get in touch! 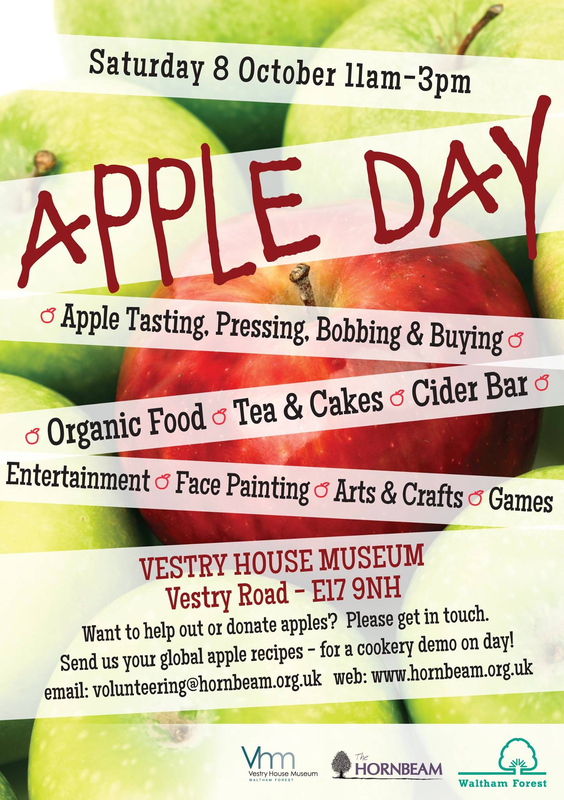 Hornbeam will be running the popular Apple Day at Vestry House Museum again this year, on 8th October. For the whole of September we’ll be picking apples (and other fruit) from the many trees in the borough, All Mondays and Fridays: Mondays starting from the Hornbeam and Fridays starting from Organiclea’s Hawkwood site. 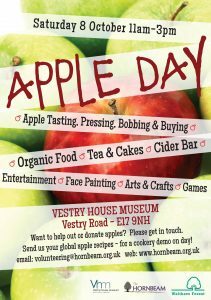 We are looking for an Apple Day team of volunteers – you’ll learn the best spots to pick apples, how to store and how to use a bike trailer if you’re interested. You can also be part of planning the most popular event in the Walthamstow calendar! Email volunteering@hornbeam.org.uk and if you haven’t already, please fill in the volunteering form online. The co-ordinating group are a combination of paid staff, directors and other volunteers. Some also represent our partner organisations. We meet to make strategic decisions about the direction and running of the Hornbeam’s projects and buildings. We are seeking new members with a keen interest in the Hornbeam who have time to spare and/or interest in the following areas: cafe organising, IT systems, finance. Other skills welcome too, and having time to spare is very important! If you are interested – please complete the online form ticking HORNBEAM COORDINATING TEAM as the role. Any questions email volunteering@hornbeam.org.uk Thanks! We are a vegan/vegetarian cafe/restaurant based in the Hornbeam Environmental Center in Walthamstow, North East London, looking for a part-time (3-4 days) chef. We work very closely with small scale organic growers in and around North East London and as such have a small seasonal menu which changes daily depending on what is available. Part-time, 3-4 days a week, occasional additional work optional. To work independently, efficiently and cleanly to produce vegan and vegetarian food to the style and standards set by the head chef. To minimise wastage and preserve/pickle/prepare fresh ingredients accordingly. To help plan menus utilising a weekly changing vegetable supply. Short order cooking including full brunch menu on weekends. To assist with stock takes and produce ordering. To maintain a safe and clean kitchen and keep necessary health and safety records. Will have at least one years professional kitchen experience of meal preparation and short order cooking. Have some experience in or an interest in vegetarian/vegan cooking. Be able to work independently with minimal direction, using initiative and common sense. Be able to communicate effectively with other members of staff to ensure smooth and excellent service. Will be able to work efficiently and calmly under pressure; the café seats 24 but if you are the only chef on a busy day then you will have to juggle lots of small jobs. We pay the London Living Wage. We will offer some training and guidance in vegan and vegetarian cooking. We offer a fun and creative environment with the opportunity to bring your own ideas and flavours. All applicants must be eligible to work in the UK, speak fluent English and must have a UK bank account and National Insurance number.